Welcome to part 1 of my little portion of the children’s book blog hop! I was invited to participate in this by two wonderful authors, so I decided to break this into two parts. First up is Aileen Stewart. 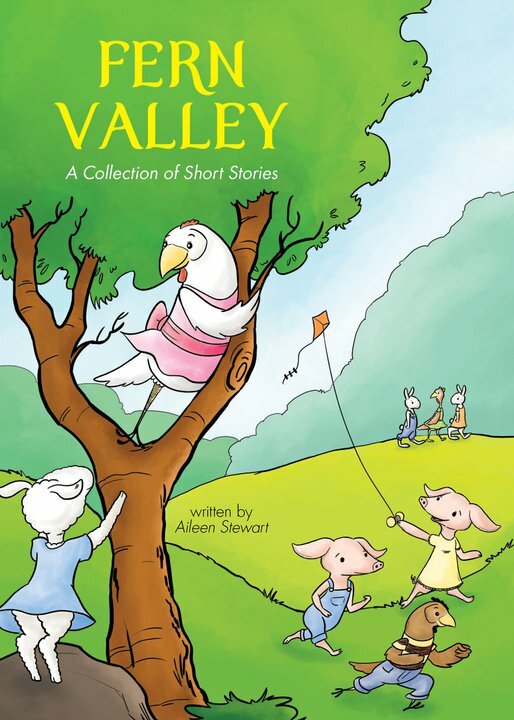 In case you don’t know who she is, Aileen is the author of Fern Valley, a collection of twelve short stories about farm animals and their adventures. Her book is one of my favorite children’s books, mainly because it brings back fond memories from my own childhood. So now, without further ado, I will answer the blog hop questions. Lately I’ve been focusing on writing short stories. Every so often I feel a need to switch gears and challenge myself to do something different. We grow as people, which means we grow as writers. Children’s books have been a huge part of my life since publishing my first book, Caroline and Rebecca: Rebecca Gets Into Trouble. I also dabbled in Young Adult writing for awhile, but at the time it just wasn’t working out the way I had wanted it to. Rather than publishing my own books, I’m taking a break to try to get some stories published in anthologies and literary magazines. This time next year I hope to be in a Master’s Program for creative writing, which means two years of my life are going to be dedicated solely to literary fiction. Does this mean I’m calling it quits with children’s books? Not at all. I’m just feeling adventurous. If we’re going to get more specific as to what I’m working on, my current short story examines being a child at heart and how growing up sometimes robs us of that childlike fun and innocence. 2) How do my works differ from other works in it’s genre? This is a really tough question to answer. In general, I think all books are different because everyone has a different style and voice. That’s what makes reading so much fun. Plenty of people have written about the importance of listening to your parents, or why it’s important to wear sunblock. But everyone adds their own spin to their stories. Well in general, I write because I can’t see myself doing anything else. My calling in life is to be a storyteller. I felt the need to write children’s books because the books I read as a child are what got me to this point. They inspired a passion for reading and exploring that I think a lot of kids today are missing out on. I want to help pass on that love to the next generation. I refuse to sit down and force myself to write for x amount of hours each day. I think that’s counterproductive. I can go weeks without writing a single creative thing. I carry a notebook with me always, and if I’m out and see something that interests me, I’ll jot down a quick note and write about it later. My best stories come from the most random bits of inspiration. As far as sitting down and writing, I don’t have a specific formula. Sometimes I like to sit outside with a notebook. Other times I sit in front of my laptop at the kitchen table with my favorite writing playlist on. It just depends on my mood that day. Tomorrow I’ll be posting two more questions asked by Lisa Tortorello, so watch out! Awe shucks ma’am, you make me blush. I’m glad you enjoyed Fern valley and that I was able to inspire you in some small way. Happy continued reading and writing!